When you buy a new piece of technology, the first thing you want to do is see how it works, but whether it’s a TV or a piece of software, there’s usually some set up involved. Mass notification systems are no different, and that set up usually determines how quickly you can start using it. Through preparation, configuration, and downloads you can get up and running in a way that is most beneficial for your organization. To get the full benefits of on-premises and mobile notifications, our InformaCast Fusion users will want to work through a handful of setup steps. 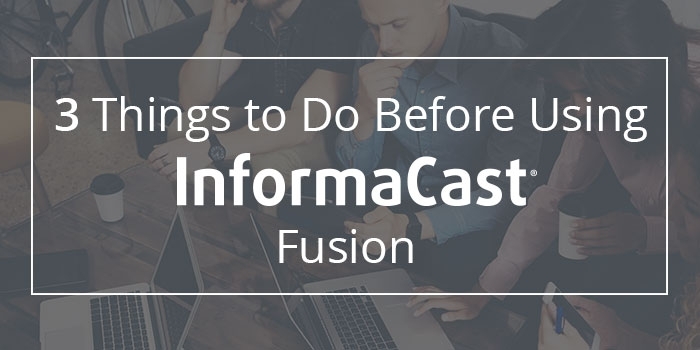 This blog post will walk through the three main steps to take when getting ready to use InformaCast Fusion for the first time. Your InformaCast journey begins in the Singlewire Support Community. This on-demand support resource offers highly consumable video tutorials, user guides, and support articles for self-service, education, and troubleshooting. All you need is your email and contract number to register. The community is where you will download the OVA to begin running InformaCast Fusion. From there you can also access resources that will help you start using InformaCast, including our Prep for Success outline, Fusion First Boot Video, Fusion Foundations videos and additional walk-throughs to help you set up the system in a way that will fulfill your organization’s safety needs. InformaCast Fusion lets you send alerts for any kind of scenario your organization may encounter, but before using InformaCast, it’s a good idea to plan out what those scenarios might be. This requires two things. First, you need to gather together the right team of people to help with your planning. Chances are you purchased InformaCast for its safety benefits, and safety planning requires stakeholders from a wide range of departments. It’s not just the job of IT or security. You’ll also want to consider consulting people from HR, facilities, and upper-level management to build a comprehensive safety plan. Once that team is assembled, you’ll need to begin figuring out what emergency situations you need to plan for. InformaCast offers a scenario planning worksheet you can download in the Support Community and work through with your team. It offers suggested events you should plan for along with sample text you can customize to suit the needs of your organization. Since InformaCast relies on pre-built messages and groups, this worksheet will help you create your message content as well as define who will receive those messages in the event of an emergency. Once the scenarios have been planned and the Fusion server software has been downloaded from the community, there are other technical checks you’ll make to ensure InformaCast Fusion functions properly in your environment. A full list of hardware, software and other technical requirements are available in the community. One prerequisite is for the IT staff to confirm that the Fusion server appliance on your network can reach the Fusion service in the cloud. Another IT checklist item is to verify the network is routing multicast traffic correctly from the Fusion server to designated endpoints. Additionally, users should consult our compatibility matrix for details on hardware and software that can be integrated with InformaCast Fusion. While this may sound intimidating, there are plenty of resources available to customers. In addition to the community, our support team is available to answer questions and troubleshoot, and our LiveChat group can help point you in the right direction. If your IT team or your IT partner need assistance, know that Singlewire has professional services packages which can be added onto an InformaCast purchase. Completing these steps will get your organization ready to begin using InformaCast to send mass notifications to on-premises and mobile devices, enhancing safety and communication for any crisis you may face.